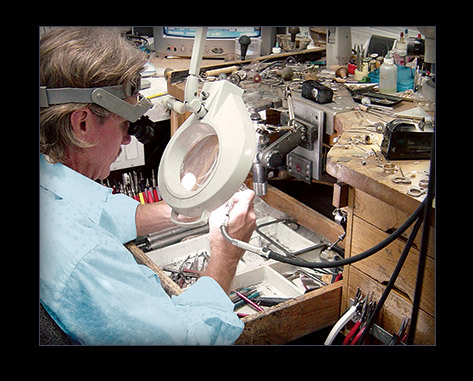 Jewelry Design Center offers expert jewelry repair completed on premises by Master Jeweler, Russell Hutcheson. We can repair any broken or damaged piece in your collection. Russell works in precious metals including, platinum, gold and silver. His lapidary expertise is applied to reset stones, cut new ones for replacement and re-cut existing stones. Jewelry Design Center can handle any job you need completed. If you need to match earrings to a necklace, repair or duplicate a family heirloom, we can help. Let us take you heirloom pieces and redesign them. We also offer professional pearl knotting. Whatever your jewelry repair needs, rest assured you will receive a quality job with Jewelry Design Center.